Following the brutal Whitechapel murders of 1888, London police and media outlets were deluged with letters claiming to have been written by Jack the Ripper. While discerning the authorship of these messages, a researcher from the University of Manchester has concluded that two of the earliest letters were written by the same person—a discovery which suggests unscrupulous journalists kickstarted the trend. 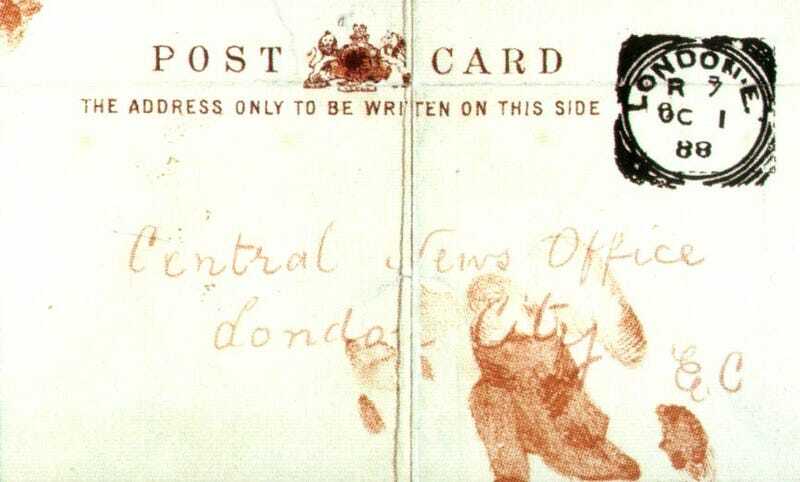 As the Whitechapel murders were unfolding, London police, the media, and various public officials received letters claiming to have been written by the killer. The investigators decided to make these letters public, leading to a flurry of copycat letters that only served to popularize the serial killer even further. In all, over 200 Jack the Ripper letters were received by police and the media, most of which—if not all—were completely fake. We’ll likely never know if the real killer was the author of any of these letters, but historical evidence suggests journalists may have been responsible for the earliest ones. Police officials managed to pin a reporter named Tom Bullen to a pair of letters, and later, a journalist named Fred Best confessed to the scam, saying he did it to “keep the business alive.” Indeed, it’s been suggested that the first batch of letters were fake messages written by reporters to sell more newspapers. Furthermore, two of the most iconic letters—the “Dear Boss” letter, in which the name Jack the Ripper appears for the first time, and the “Saucy Jacky” postcard—were written by the same person, a conclusion based on a handwriting analysis. A new study published in Digital Scholarship in the Humanities is adding credence to this theory by showing that the author of these texts, in addition to having similar handwriting, also expressed a consistent linguistic style, and that these two early Jack the Ripper letters were indeed written by the same person. This is important because prior evidence exists to link the “Dear Boss” letter and “Saucy Jacky” postcard to the Central News Agency of London by virtue of another Jack the Ripper text known as the “Moab and Midian” letter. To connect the letters to the same author, Andrea Nini, a forensic linguist from the University of Manchester, identified linguistic constructions that appeared in both letters, such as the phrasal verb “to keep back” (meaning to withhold). Nini says it’s the first time modern forensic linguistic techniques were used to analyze these historic letters. Nini confirmed this by looking at the remaining 200 letters. Even though most of them were produced by hoaxers who could access and virtually plagiarize the ‘Dear Boss’ letter, none of them shares the linguistic similarities uncovered by this research. This analysis doesn’t identify the killer, or the author of the two letters, but it does nudge us closer to the journalist theory. Even if the journalist theory is confirmed, however, it’s probably not going to tell us much about the killer, or whether or not there even was a Jack the Ripper. “At the end of the day we are not even sure that the five murders were connected, and there are several theories that consider the possibility that not all the five ‘canonical’ murders were committed by the same person,” said Nini. A possible limitation of the study is that it’s impossible to know the extent to which hoaxers were trying to imitate the style of “Dear Boss.” Nini says it’s difficult to answer this question, and he’s working under the assumption that they were in fact trying to do this. But we can’t be certain, so the new data can’t be treated as a real experiment, he says. Interestingly, the new research could also tell us something about current events.